World-renowned animal welfare expert Temple Grandin, Ph.D., 71, captivated the Maple Leaf Foods team during a visit to its headquarters in Mississauga when she offered insights into animal welfare, autism and the challenge of being a woman leader during a live “Oprah-style” conversation with Vice President of Communications and Public Affairs Janet Riley. The event, sponsored by the company’s Women’s Impact Network, was webcast throughout the company and team members posed their own questions to her during a lively and frank question and answer portion. Grandin and Riley began collaborating 28 years ago at the North American Meat Institute in Washington, DC, when Riley invited Grandin to write the industry’s first objective scoring system for animal welfare, now a global standard. 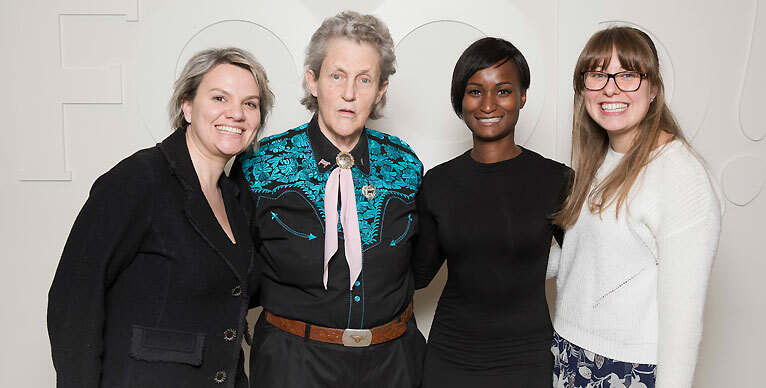 Since that time, Grandin has earned global accolades for her work to improve animal welfare and has also been the subject of the Emmy-award winning biopic Temple Grandin. While in Mississauga, Grandin took a virtual reality tour of Maple Leaf Foods’ soon-to-be-constructed poultry plant in London, Ontario, and met with the company’s engineering and animal welfare teams. “Man, you’re up to some really good stuff,” Grandin said during the live conversation. “You’re going to be leaders. You’re going to be world leaders. 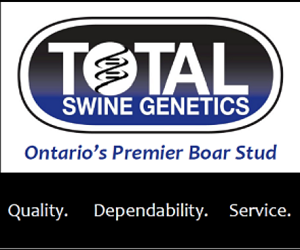 You could set the standard for the world.” She specifically praised Maple Leaf Foods’ Advanced Open Sow Housing system and its embrace of CO2 stunning for poultry and pigs. Although she is one of the most accomplished autistic people in the world, Grandin made clear that she prefers to be known for her work in animal welfare. She made clear that she has no misgivings about her autism diagnosis. “I like the logical way I think. I’m horrified at how illogical normal human beings are,” she said, arousing laughter from the audience. Grandin offered suggestions for parents with autistic children, recommending turn-taking games that help children learn social skills. She also encouraged parents to help children find friends with shared interest that can help autistic children learn to navigate friendships. 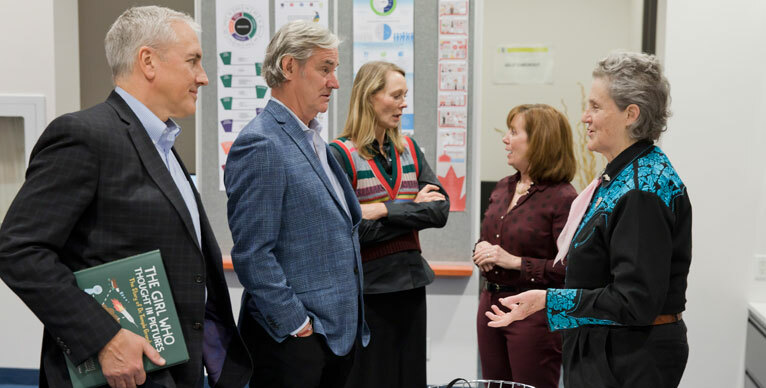 During the question and answer period, a Maple Leaf Foods team member introduced his six-year-old daughter to Grandin and she encouraged him to allow his daughter to say her name for the audience – which she was able to do –generating a round of applause from the audience. Grandin encouraged young women to take advantage of internships that allow hands-on, practical experience as a way to get engaged in the workplace and find the career that’s right for you.